Oh yes please! Carrot Cake snuggles up with cream cheese frosting in this simple yet decadent version of a Swiss Roll. Like a Pumpkin Roll but more spring like. Perfect for spring entertaining or special holiday meals, or eating it alone in the pantry when no one is looking. 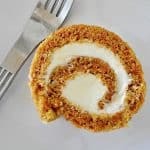 This Carrot Cake Roll is actually a fun baking project to do with kids too, so maybe plan a little kitchen fun with your kids. We all know and love the Pumpkin Roll right? And my Pumpkin Spice Latte Cake Roll. And don’t forget my Banana Roll either. Well here’s another version, the Carrot Cake Roll. I didn’t come up with it but was inspired by this post from Crazy for Crust. I amped up the spices a bit, by adding a little cardamom and allspice to round out the spices, I love a spicy carrot cake, don’t you?. As I said this is a fun baking project to do with kids because of the way it’s rolled up. My boys are always amazed when we turn a hot cake out on dish towel and roll it up while hot. 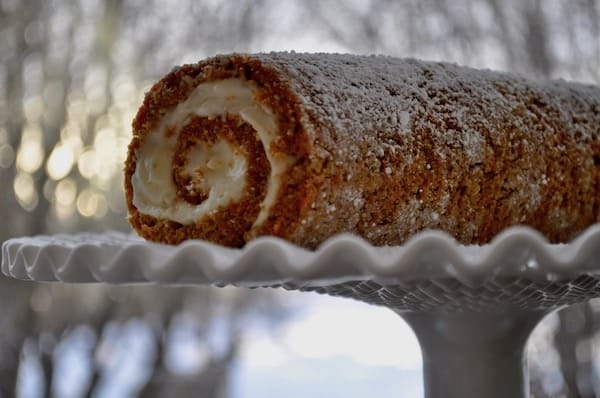 The best part is un-rolling it, spreading it with cream cheese frosting, roll it right back up. Plus there’s cake when you’re done. WIN! One more amazing thing about this cake. FREEZE IT. Yes, freeze it once you’re done filling it and keep it frozen until you’re ready to serve. Then slice it while it’s still frozen. It slices perfectly. No messy frosting smears. Slice it all at once and freeze individual slices. Or slice it and serve it. Or leave it whole slicing off the pieces you need. Of course you can always slice it regularly and it will be fine. 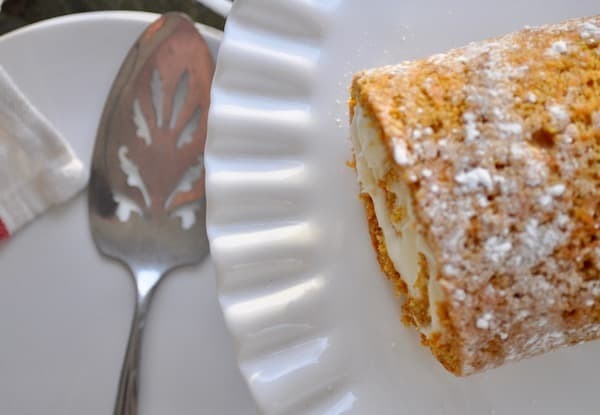 Carrot Cake snuggles up with cream cheese frosting in this simple yet decadent version of a Swiss Roll. 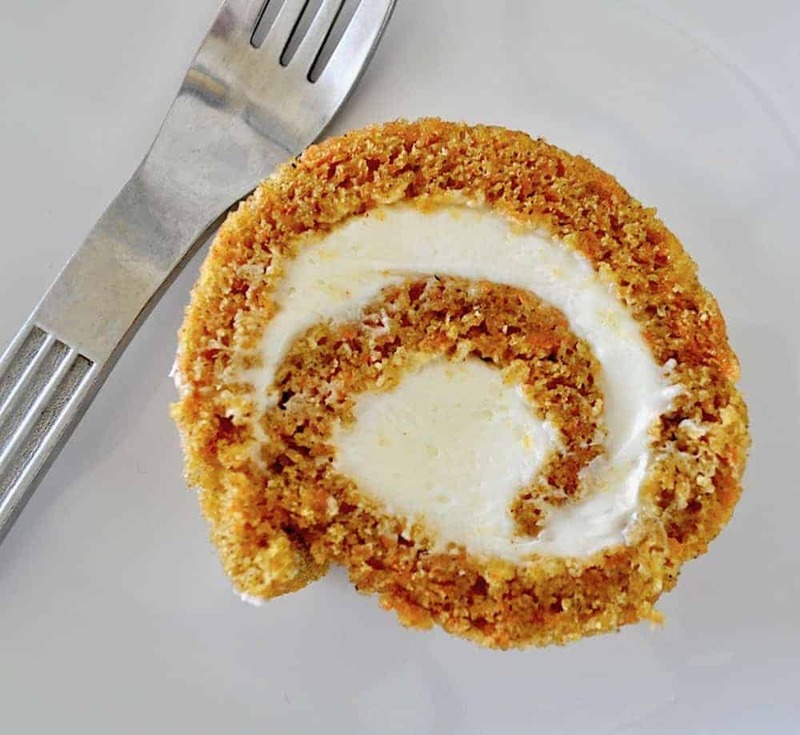 This Carrot Cake Roll is perfect for spring entertaining or special holiday meals, or eating it alone in the pantry when no one is looking. Any which way you like. Thanks for reading, would you mind pinning this recipe? I am still so intimidated by the cake roll!!!!! Yours looks awesome!